A teenager was attacked by a shark and air-lifted to the hospital early Saturday morning, according to Encinitas lifeguards. The attack happened at Beacon’s Beach in Encinitas, around 6:55 a.m. According to the San Diego County Sheriff’s Office, a 13-year-old boy was flown to Rady Children’s Hospital with serious injuries to his ear and shoulder. By Sunday afternoon, the boy's condition had been upgraded from critical to serious condition, Rady's Children's Hospital said. 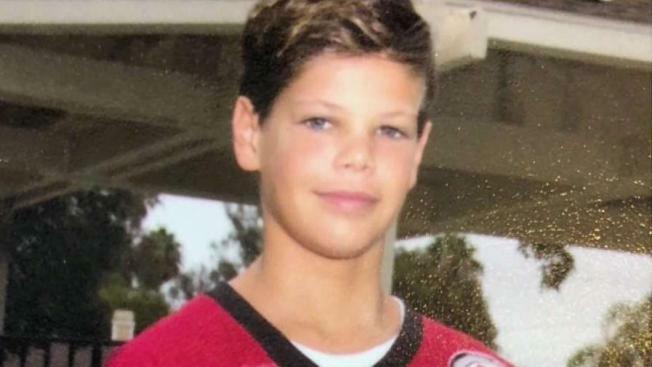 He has been identified as Keane Hayes of Encinitas. "The boy’s parents want to inform family, friends and the entire community that he is expected to make a full recovery," the hospital said in a statement. "At this time, the family continues to ask for privacy. They are grateful for all of the support they have received so far and want to also thank the staff at Rady Children’s." NBC 7 spoke to a Chad Hammel, a lobster diver who helped bring the teenager to safety. The witness said approximately 30 people were in the water at the time of the attack, catching lobster. “I paddled to him,” he said, “and there was a big wake of blood behind him. His entire back was open. The shark hit him in the clavicle. The shark’s top teeth got him in his cheek,” he said. Two other men also helped with the rescue. The response from lifeguards was quick since they were on duty for the first day of lobster diving. The teenager arrived at Rady Children’s Hospital around 7:45 a.m. The attack happened near the shore in about nine feet of water. The boy was in critical condition Saturday with traumatic injuries to his upper body. He was conscious when he was taken to the hospital. The shark was about 11 feet long, Giles said. By Saturday afternoon, the beach was full of signs saying the area was closed to swimmers, and by Sunday morning, lifeguards were on wave runners actively warning people to stay out of the water. The water from Ponto Beach in Carlsbad to Swamis in Encinitas is closed and will be for the next 48 hours until Monday morning at 7 a.m. The beaches are open. Giles asked that people leave the warning signs in place as people have been taking them as souvenirs. They are now ordering $800 worth in signs to replace the 20 to 30 stolen ones. “Please don’t take the signs. You’re stealing public property," Giles said. Despite the closure, surfers were seen in the water at Swami's Beach Sunday morning. The shark has not been seen since the attack and "There has been no activity with shark sightings since the incident this morning," Giles added at a 4 p.m. news conference Saturday. The Carlsbad Police Department is using a drone to check to look for any sharks that may be a threat, he said. They are also using jet skis to search. There are non-threatening sharks in the water, he added. Encinitas Lifeguards are also working with a scientist from Long Beach State University to try to determine what type of shark bit the boy. Other agencies helping with the investigation are California State Park Lifeguards, Solana Beach Lifeguards, the San Diego Sheriff's Department, Encinitas and Carlsbad fire departments and the U.S. Coast Guard is aware of the incident. There was a fatal shark attack in Solana Beach in 2008. A Go Fund Me page has been created to help with medical bills.